Get access to some of BCC Distribution’s essential resources such as video demonstrations in a live production environment, webinars on the latest data collection and printing technologies for SAP®, see illustrations of BCCD’s best practice methodologies, learn about the latest features and functionalities from our software, media and equipment partners, and much more. View our library of resources to expand your knowledge and get answers to your pressing questions. BCCD on YouTube | Visit BCCD’s YouTube channel to watch any of our many on-demand videos about TranASAP™, PrintASAP™ and more. Tiffin Motorhomes is a family-owned manufacturer of industry-leading motorhomes based in Red Bay, Alabama. Partnering with BCC Distribution and Zebra Technologies, Tiffin Motorhomes has implemented a successful SAP-based RF scanning and barcode printing system to improve inventory control accuracy and visibility. This viewable video takes you on a brief tour of BCCD’s TranASAP™ RF scanning and barcode printing solution in action at Tiffin Motorhomes. 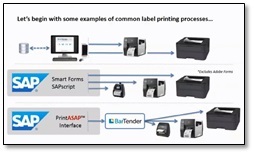 BCC Distribution‘s methodology for printing with SAP® (PrintASAP™) takes the process of designing and printing a simple barcode label and applies that same ‘ease-of-use’ approach to give SAP® users simplicity and flexibility in their printing system while also easing the burdens of printing system maintenance. PrintASAP enables SAP-automated printing to nearly any printer, including mobile printers- triggered by SAP®, and empowers users to leverage RFID printing and encoding technologies for even greater system automation. Learn more about printing for SAP® in this BCC Distribution webinar. 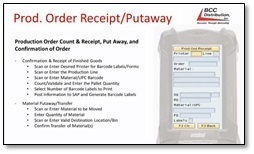 This webinar, is part 2 of a 3-part webinar series to illustrate BCC Distribution’s approach to using barcode technology directly integrated with SAP® to improve accuracy, visibility, and to add simplicity to an inventory control system using SAP’s IM, WM, and EWM modules. Learn more about options for warehouse labeling and location identification solutions and installation services offered by BCC Distribution, Inc. The Zebra MC3300 can be configured four ways – pistol-grip, turret with rotating head, straight shooter 0º scan and 45º scan – giving you options for every use case, designed with ergonomics and performance in mind. 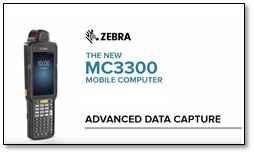 Plus, the Zebra MC3300 captures data from as far away as 70 feet. 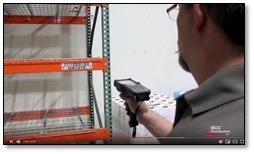 It takes on low- and high-impact scanning scenarios, reliably scans at low, intermediate and long ranges and accurately captures multiple barcodes with a single trigger pull. Refresh & protect warehouse racking- whether your warehouse has have seen a lot of use or is brand new. 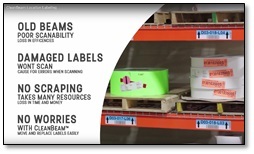 CleanBeam can be applied right over any existing labels and scratches to cover them completely and protect against future wear. May be matched to integrate seamlessly with your racking.